We haven’t discussed genre paintings a lot so far. Jan Steen is a name you may or may not know. He is a Dutch Golden Age Baroque genre painter whose own reputation has been eclipsed by his contemporary Johannes Vermeer, but who is still a huge figure in art history. So how do you tell if you’re looking at a Jan Steen? The Feast of Saint Nicholas (c. 1665-1668) by Jan Steen. Rijksmuseum (Amsterdam, The Netherlands). This is about as big a painting as a Steen will get. 33 1/2 by 27 inches. The Night Watch (1642) by Rembrandt van Rijn. Rijksmuseum (Amsterdam, The Netherlands). This baby is 12 by 15 feet! Plenty of Dutch/Flemish Baroque artists loved themselves some big canvasses. Peter Paul Rubens, Jacob Jordaens, Frans Snyders, Rembrandt, you name it. Steen was not one of them. The second thing to look for is a tavern. Jan Steen painted all sorts of scenes, including religious scenes (he was a Catholic), but his favorite thing to paint was a raucous tavern. One could say he was painting what he knew: his father was a relatively well-to-do brewer! 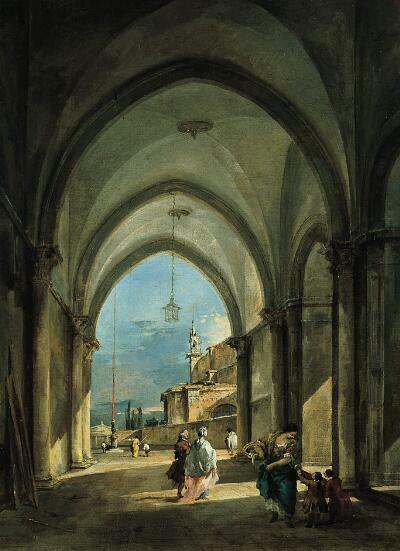 Later in life, Steen himself opened up a tavern to supplement his relatively meager income as a painter. In the Tavern (1660) by Jan Steen. Rijksmuseum (Amsterdam, the Netherlands). 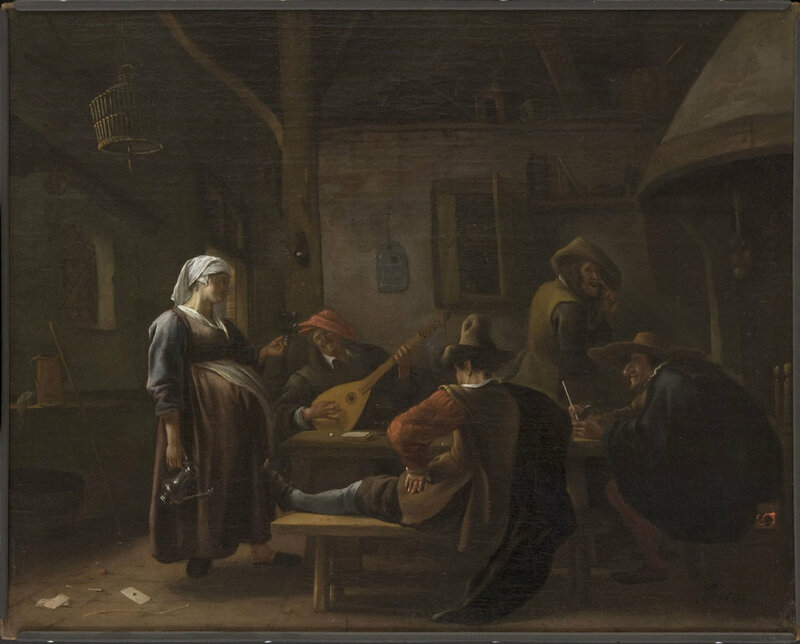 In this painting, a lecherous old man seems to be trying to have his way with a scullery maid while men gamble, a dog bites away flees, a peasant drains the last of his beer, and the tavern itself sits in general disarray, possibly because of a recent brawl. Jan Steen’s paintings usually have a lot going on, and they are almost always funny. Let’s face it: most paintings have zero sense of humor. I mean it: zero. And Jan Steen’s are almost universally human and funny. He doesn’t paint important people striking important poses. He paints peasants and common-folk going about their daily life, especially when they’re drunk. Steen’s bawdy sensibility, like Hieronymus Bosch’s before him, is at odds with the high-minded, grand paintings of his day. Steen’s paintings are often described as satirical or even farcical, but one could argue that Steen is painting life as it really is, and that everybody else’s paintings, of noblemen in purely ceremonial military uniforms and women in dresses so fragile they couldn’t wear them outside, were the stuff of farce. It’s as if paintings like Rembrandt’s The Night Watch, commissioned by an Amsterdam militia company hoping to look important, are the olden-day equivalent of Instagram, presenting a very filtered sense of a person, while Steen’s paintings are candid photographs. There’s more of a humanity to his paintings than even, say, the famous smiles in Frans Hals’ otherwise formalistic portraits that hint at an informal personality under all the pomp and circumstance. There is a lovable shamelessness to Jan Steen’s paintings. In fact, a “Jan Steen household” in Dutch parlance is a messy one. It is no wonder that Steen is seen as the forerunner to William Hogarth, the great British painter, humorist and storyteller who was the perfect antidote to over-the-top Rococo tastes. The Temptation of St. Anthony (c. 1650) by David Teniers the Younger. The Hermitage (St. Petersburg, Russia). Peasants Before an Inn (1653) by Jan Steen. Toledo Museum of Art (Toledo, OH). Steen and Teniers the Younger are quite similar painters in many ways. Teniers liked to paint people up to no good too, including drinking the day away and relieving themselves in the middle of polite company. Yard of Peasant House (1640s) by David Teniers the Younger. The Hermitage (St. Petersburg, Russia). Tavern Scene with a Pregnant Hostess (c. 1670) by Jan Steen. Philadelphia Museum of Art (Philadelphia, PA). So we’ve talked about Anthony van Dyck before, specifically the way he influenced Sir Thomas Gainsborough in the composition of his portraits. But van Dyck, as a giant of the Baroque, deserves his own entry. Go to any museum, and you’ll probably see a van Dyck hanging on the wall. The dude was a prolific an artist as any but, say, his compatriot Peter Paul Rubens, who relied on a workshop to boost his output. So how do you spot him? Today we’re going to cover two easy, hilariously non-technical ways to pick out a van Dyck. James Harden of the Houston Rockets, AKA "The Beard." Self-portrait (1633) by Anthony van Dyck. Private collection. Charles I (c. 1635) by Anthony van Dyck. The Royal Collection (Windsor, UK). van Dyck was the court painter to English king Charles I, which means he painted Charles a lot (before Charles was beheaded in 1649, anyway). That’s why Anthony van Dyck was knighted in England and is often listed as “Sir Anthony van Dyck.” Remember this painting from our chat about Gainsborough’s portraits? Charles I and His wife Henrietta Maria with Their Eldest Children: Charles, Prince of Wales (Charles II) next to His Father and Mary, the Princess Royal, in the Arms of Her Mother (1633) by Anthony van Dyck. The Royal Collection (Windsor, UK). Charles I at the Hunt (c. 1635) by Anthony van Dyck. The Louvre (Paris, France). And don’t get Charles I confused with his son, Charles II, who had jet-black, thick, curly hair and either a pencil moustache or a clean-shaven face. Also a villainous sneer. Charles II (c. 1676) by John Michael Wright. The Royal Collection (Hampton Court Palace, UK). Get a load of that hair! Salomon van Ruisdael and his nephew Jacob are the two giants of Dutch Golden Age landscape art. They were both versatile painters. If you stroll through a museum and see a Dutch Baroque landscape of a harbor, with or without boats, Dutch cottages along waterways, watermills, snowscapes, ruined buildings, fortress or churches in a wood, you could be looking at a painting by Salomon or Jacob van Ruisdael. View of the Oude Kerk (1675) by Jan van der Heyden. The National Gallery (Oslo, Norway). The van Ruisdaels may hint at a city or port town in the distance, but their interest is in the Dutch countryside and villages. In terms of their subjects, the van Ruisdaels were much more traditional, and van der Heyden was a pioneer. van der Heyden’s interest was much more in architectural details and the man-made, which you’ll see even more obviously in his precise interiors, especially of churches. Sea Battle of the Anglo-Dutch Wars (c. 1700) by Willem van de Velde the Younger. The Yale Center for British Art (New Haven, CT). So far, we’ve narrowed a van Ruisdael to a bucolic countryside or harbor, painted as if “on location” (read: not in the middle of the ocean and not from, say, a bird’s point of view or “God view” farther up). View of the Town of Alkmaar (c. 1650s) by Salomon van Ruisdael. The Metropolitan Museum of Art (New York, NY). The water in a Salomon van Ruisdael is still as can be. Rough Sea at a Jetty (c. 1650s) by Jacob van Ruisdael. Kimbell Art Museum (Fort Worth, TX). That’s some choppy water! At a dock, no less! It’s a bit of an unfair comparison to the river scene in inland Alkmaar, but Salomon painted more placid river scenes and Jacob painted more harbor/sea scenes. He’s interested at the moment the water crashes against the rocks and itself. The painting “ends” at the bottom of the frame right at the moment of greatest violence. Unlike his uncle, he’s not interested in the calm river another quarter mile off. A Draw-Well with Cattle before Beverwijck Church (mid-1600s) by Salomon van Ruisdael. The Ashmolean (Oxford, UK). Mountain Torrent (1670s) by Jacob van Ruisdael. The Metropolitan Museum of Art (New York, NY). All that separates this farmer from falling into a powerful waterfall and the rocks below is a rickety wooden bridge. His – and humanity’s – relationship to nature is precarious at best. Even the clouds in the two painters’ works betray this theme. Salomon’s are almost universally white and puffy. Jacob’s are just as often dark and foreboding, threatening rain at any moment. Landscape with the Ruins of the Castle of Egmond by Jacob van Ruisdael (c. 1650-1655). The Art Institute of Chicago (Chicago, IL). Get a load of those clouds! And that ruin. This is Jacob’s vision of humanity’s never-ending – and ultimately fruitless – struggle to fight entropy, to conquer nature. It’s no wonder that Salomon, he of the sunnier paintings, never painted any ruins. Landscape with a Half-Timbered House and a Blasted Tree (1653) by Jacob van Ruisdael. Speed Art Museum (Louisville, Kentucky). In the painting above, one is left to wonder if the home behind the tree is the next to be struck by lightning. Odds are the museum you’re going to has a van Ruisdael. They were fairly prolific painters – and their work was sought-after, even in their own time. If you see a painting that looks like it might be one of theirs – Baroque landscape, specifically Dutch countryside or harbor, low point-of-view, etc. – take a second before you read the plaque and ask yourself if it’s a Salomon or a Jacob. If you get it right, pat yourself on the back without hitting the statue behind you! So far we’ve covered Italianate landscapes by two Frenchmen – Claude Lorrain and Hubert Robert – as well as an Italian, Giovanni Paolo Panini. We’ve also looked at some British landscapes, by John Constable and to a lesser extent, animal painter George Stubbs. Today we’re going to shift into Dutch landscapes to keep you on your toes, starting with Meindert Hobbema. Well, he’s not exactly a household name, but he’s one of the finest landscape artists in history. I mean it! He was a pupil of the more-famous Jacob van Ruisdael, working in Amsterdam at the tail-end of the Dutch Golden Age of painting. Like so many other great artists, he wasn’t really appreciated in his lifetime, and it took about a hundred years before he came to any kind of prominence, with the English especially snapping him up for their collections. You’ll see more Hobbemas in English museums today than any other for that reason. For many years, Hobbema’s signature was replaced by art dealers with Ruisdael’s, in order to get better prices, even though Hobbema is arguably the better painter. For my money, Hobbema has more atmosphere, and his subtle use of chiaroscuro gives his dark woods and sunny streams nothing short of a poetic, fairy-tale quality. So how do you pick out a Hobbema? Start with the subject matter. Does it look, well, Dutch? You won’t see ruins from antiquity. You won’t see Tuscan houses with terracotta roofs. You’ll see thatched or shake-shingle cottages and farmhouses, with trees like oaks, birches, maples and beeches, not palms or ferns or any kind of Mediterranean plants. The painting should be set in spring through fall (unlike, say, Avercamp or Brueghel before him, Hobbema did not seem to have an interest in snow!). Is it of a road leading to a pond, a stream, a mill on a pond or a stream, the woods, or a hedge? Is the perspective from, say, about ten to fifteen feet above the road, at a distance of about one to two hundred feet from the nearest building or trees? Outskirts of a Wood by Meindert Hobbema (c.1665). The Wallace Collection (London, UK). Summer. Aerial perspective. Stream. Road. Building a hundred-plus feet away. Check, check, check, check, and check! But that’s not even the easiest way to tell a Hobbema. It’s the trees. The man painted some squiggly trees. Don’t believe me? Get a load of those trees! Apart from subject matter and idiosyncratic trees, Hobbema is doing something interesting with the focal points of his paintings. In a lot of landscape paintings, you can sort of look anywhere. But Hobbema’s roads and streams “make” you focus down them, usually to buildings or a grove of trees in the back. (This is called linear perspective.) There’s an architectural quality to his paintings, which are almost all of wild countryside only partially tamed by man. In many Hobbemas, you’ll see small figures, usually in the center of the painting, going down the charted road, stream, etc., staying away from the “wild” edges of the frame. As a final “cheat code,” look for clouds in his paintings. If there’s a Hobbema without puffy white clouds, I haven’t seen it! Walk into most halfway-decent museums, and you’ll see a cityscape of Venice, especially the canals, from the late Baroque or early Rococo. You might think to yourself, “Oh look, a Canaletto!” After all, Canaletto’s name is the easiest “cheat code” for paintings of all. Basically all he did was paint canals and his name was “Little Canal” in Italian! I’m reminded of that old “dad joke”: “what are the odds of Lou Gehrig getting Lou Gehrig disease? !” But Canaletto was actually born Giovanni Antonio Canal, the son of painter Bernardo Canal. What are the odds?! But next time you walk past that Venetian canal painting from the 1700s, check the plaque. It might not be a Canaletto. There was another canal-painting giant from this time, and his name was Francesco Guardi. So how do you tell them apart? Let’s start with Canaletto. Canaletto often likes to use wider views of the canals. The painting below of the entrance to the Grand Canal is probably about as close-up a view as his paintings will get. He is also incredibly exacting, capturing every detail, with near-photographic precision, of the waterways and architecture of the city. His images are crystal-clear. He was absolutely painstaking in getting the architectural perspective correct. You can imagine him penciling out every new composition with a ruler before getting down to the paint. Note the church in the background, the Santa Maria della Salute. The Entrance to the Grand Canal, Venice by Canaletto (c. 1730). Museum of Fine Arts (Houston, TX). As you can see, this is no imagined landscape. This is Venice. No disrespect to Canaletto, but I like to imagine his paintings as early postcards of the city. In fact, that’s sort of what they became, as Englishmen shipped them back home while on their Grand Tour of Continental Europe. Now let’s try a Guardi. Santa Maria della Salute by Francesco Guardi (c. 1770). Scottish National Gallery (Edinburgh, UK). Same subject from almost an identical angle and yet, a totally different painting. Its airy brush strokes give it a much more impressionistic feel (a shift from the Baroque to the Rococo). The loose brushwork and small dots combine to give Guardi a unique “touch.” In Italian, it was referred to as pittura di tocco. His paintings have a much more atmospheric quality. On the surface, his views of Venice are far less accurate than Canaletto’s. And yet, they may capture the city much better than his contemporary does. Anyone who has been to Venice can testify to its beauty; but they might also point out its decrepitude. Its waterways choked by algae and polluted by human sewage; its crumbling stone; its smell. None of that is captured in a Canaletto painting, and it is in a Guardi. Star Wars: Episode IV – A New Hope (1977). Star Wars: Episode I – The Phantom Menace (1999). This thing looks like a shiny new concept car! Venetian Capriccio by Francesco Guardi. The Norton Simon Museum (Pasadena, CA). As a final note, Canaletto’s paintings almost always take place in the dead of afternoon, with a bright sun reflecting off the waters. Guardi’s paintings take place at all times of the day, the most atmospheric of which during the gloaming. Now, just as a Hubert Robert painting is like being “inside” a Lorrain painting, so too is a Giovanni Paolo Panini painting like being inside a Canaletto or a Guardi. What do I mean by that? Well, you’ll have find out next time! Claude Lorrain, also known as Claude Gellée, or simply Claude, is famous for his pastoral and antiquarian landscapes. Lorrain is a staple of the Great Museums. So how do you spot him? Look for wide, idealized and usually Italianate landscapes, with small figures in the foreground. Look for ruins. Lorrain loved himself some ruins! He also, as you can see from this painting, loved scenes from antiquity, often at harbors. Seaport with the Embarkation of the Queen of Sheba (1648) by Claude Lorrain. The National Gallery (London, UK). Look for a scene in the early hours of the morning or at dusk. Those times of the day probably interested Lorrain the most so that he could paint the poetic light effects on the water, for which he often employed a rare, deep blue ultramarine color that was prized during the Renaissance. It’s no accident that Lorrain, although he was a towering figure of the Baroque, used Renaissance pigments. Like his French compatriot Nicholas Poussin, he made his star in Rome. Lorrain went on to inspire countless landscape painters over the coming centuries, including Hubert Robert, who took the beauty found in ruins and decay to new heights. But that’s for next time.